The comic book sequel to the hit feature film, starring Denzel Washington and Mark Wahlburg - 2 GUNS! 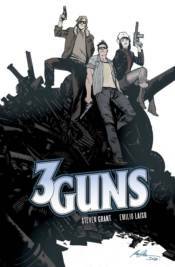 After barely surviving a barrage of ultra-violence and being burned by those closest to them in 2 GUNS, the lives of ex-undercover agents Bobby Trench and Marcus Steadman get even more chaotic when the pair again cross paths in the pages of 3 GUNS, writer Steven Grant's follow-up to his 2006 crime caper. Now, after racing headlong across the Southwest, desperately outrunning Feds and mobsters alike while trying to clear their names, Trench and Steadman are pulled into another impossible situation: brokering gun deals between the Russians and anti-government revolutionaries...from opposite sides. And little do they know, a Third Gun has her eyes set on the ultimate prize--and she won't go down without a fight.